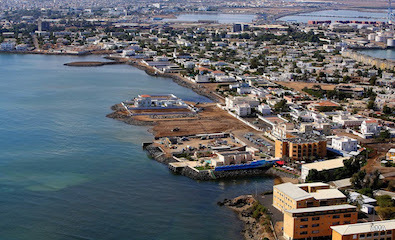 Djibouti City is the capital and largest city of the Republic of Djibouti. Its contemporary population is estimated at 624,000, which is about 70% of the population of the entire nation. Located on the Horn of Africa, Djibouti was an important trade center for both the Arabian Peninsula and Eastern Africa. It also had links to the East African city states. About 95% of the city’s population is Muslim. Zelia, a port city east of present day Djibouti in what is now Somalia, was the first settlement in the region. Dating back to the first century C.E., it developed as a site of the silver and slave trade and was inhabited by both the indigenous Afar people and by immigrants from Arabia. By the thirteenth through sixteenth centuries there were frequent power struggles between the Christian Abyssinians (Ethiopians) and Muslim sultanates in the region. By the seventeenth century the Afar and Issa people were the majority of residents in the city. Throughout the nineteenth century, Arab traders paid tribute to Afar and Issa chiefs to use the interior for their caravans. Trade in the Horn of Africa attracted Europeans. In 1881 France established a trading company in the port city of Obock; however, the surrounding mountains of Obock made it difficult for the French to construct a railroad to Ethiopia. In 1885, shortly after the Partition of Africa, the French signed a treaty with Issa chiefs that enabled Léonce Lagarde, the French representative, to establish a permanent presence in the region. They created the colony of French Somaliland in 1888 and established Djibouti City as the base of operations. Djibouti City became the capital of French Somaliland in 1892. Djibouti City grew rapidly after Governor Léonce Lagarde signed a treaty with Emperor Menelik II of Ethiopia to establish trade with his nation in 1897. The French constructed a railroad and a deep-water port, which also drew people to Djibouti City. By 1900 an estimated 15,000 people resided there. An increase in the volume of trade in Djibouti City was sparked when the railroad reached Addis Ababa in 1917. After invading Ethiopia in 1935 Italy constructed a port at Assab, a city in present-day Eritrea. The development of that port shifted trade away from Djibouti City. After France fell to Germany during the second year of World War II, the Vichy government of France seized control of French Somaliland in 1940. In 1942 British troops instituted a blockade on Djibouti City’s port, forcing the Vichy French to surrender. The British occupied the city until 1943. Following World War II France granted French Somaliland representation in the French National Assembly. In 1958 the colony voted against independence and remained associated with France. Despite nationalist riots that left many dead and injured, a second referendum on independence in 1967 also failed. Hassan Gouled Aptidon, an Issa and president of the Ligue Populaire Africaine pour l’Indépendance (LPAI), the leading nationalist organization, initiated a third referendum for independence in 1977. This one passed and independent Republic of Djibouti emerged on June 27, 1977 with Djibouti City as its capital. Aptidon was declared the first president of the new republic and ruled Djibouti as a single party state. In 1999 Aptidon resigned the presidency and his nephew, Ismail Omar Guellah, quickly assumed the office. Guellah won a second term in a one-candidate race in 2005, and in 2011 he won a third term in office. Ari Nave, “Djibouti, Djibouti," and "Djibouti” and “Gouled Aptidon, Hassan,” Africana: The Encyclopedia of the African and African American Experience, Kwame Anthony Appiah and Henry Louis Gates, Jr., eds. (New York: Oxford University Press, 2005); BBC News “Djibouti Profile,” The BBC News Website (December 22, 2013), http://www.bbc.com/news/world-africa-13231764.